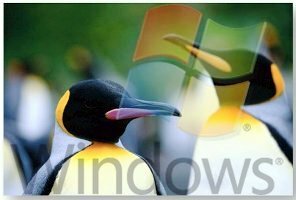 Linux as an open-source operating system was developed by volunteer programmers to compete with the proprietary Windows operating system of Microsoft and never to work with it. This is the reason why it has its own application programs that are native to it. If the Linux developers had any plan to co-operate Windows applications, they would have done so right from the start. Yes, there are some application software that runs both on Linux and Windows like the Open Office Productivity Suite but this so because the Open Office was developed that way, to work on both Linux and Windows. So what do I say to some i-café owners currently studying how to install Linux with the objective of running Windows applications especially some popular online games? Installing Linux operating system (OS) to run Windows applications is, at the very least, a silly idea. I have already stated the reason above and I wish to repeat that Linux as an OS was not developed to run Windows applications. Yes, there are plugins like Wine (Windows Emulator), also an open-source software like Linux, which is said to enable Windows applications to run on Linux. And indeed, those plugins can run some Windows applications but how? As good and as stable as in a Windows environment? Your guess is as good as mind. The foremost question in the endeavor is why do you want to install Linux to run Windows applications. Because Linux is free to own and install unlike Windows that you need to buy the right to use the software? You want to run cracked Windows games on free legal Linux to show some sort of compliance to the anti-piracy law? If these are reasons why you are doing your best to install Linux in your i-café, you are bound to fail because Linux, in the first place, was not developed to run Windows online games. What can you do then? You can, of course, quit the idea and buy genuine Windows OS which is currently being sold at promo prices never before offered in the i-café industry in the country. Your other option is go Linux all the way. Install it and let your customers play the games native to it. In so doing, if majority of i-cafés follow suit, then there is a big chance that the game developers would look your way and port their popular games to Linux. Wild dream? Why don’t you give it a try? Best solution for me at home and at the office is running Windows in a virtual machine. Most machines these days are powerful enough to handle it. Wine was never very good at doing the good stuff like iTunes or audio based Windows apps.